If you are leaving on a trip soon, these essential European youth hostels could easily become your dream destination. Europe, with its great history and culture, is full of beautiful landscapes and wonderful places to discover. Through all these historic sites and small, well-kept secret places are places where you can stay that are just as impressive. Whether you travel light or with your whole life in your suitcases, these 12 essential European youth hostels will please you and offer you the comfort you need. Winner of the Best small youth hostel, the Sungate One hostel, situated in Madrid, is simply beautiful. Lively and welcoming, this place, located in the centre of Madrid, is ideal for meeting new people and feeling the pulse of the city. Offering many possibilities to tourists in terms of accommodation, this hostel has received only good reviews on the different booking sites from all over the world. With its certificate of excellence awarded by Trip Advisor in 2018, the elegant Casa Kessler Youth Hostel is full of charm. From its well decorated rooms to its enchanting atmosphere, the place is chic and original. Modern and inviting, this destination in the heart of Barcelona has a beautiful terrace that adds a little magic to every Spanish stay. On the other hand, since it is small, the hostel can only accommodate a few travellers each day, it is, therefore, necessary to book early to be part of the lucky ones who reside here. Only 10 minutes from the Eiffel Tower, the 3 Ducks gostel in Paris is certainly a must, not only for its location but also for its atmosphere and splendour. Freshly renovated and refurbished, this destination instantly appeals to visitors. In addition to being fully air-conditioned, the hostel has no curfew and offers free breakfast to its guests, as well as a full kitchen and bar. Convivial, original, welcoming and irreproachable are some of the compliments Slo Living Hostel constantly receives. Charming to the vast majority of its travellers, the exemplary clean hostel allows everyone to sleep comfortably in facilities worthy of the great hotels. If you are lucky enough to stay there on a Sunday or Monday evening, the evening meals offered to guests make you discover Lyon gastronomy at its best. Just steps from downtown Rome, The Blue Hostel is perfectly located to discover the history of this exceptional city. Although the place has been refurbished in recent years, it has still kept many of its historical elements such as its original wooden ceilings that recall its construction in the 17th century. You can sleep on both ears in a cozy and quiet place. Comfort and conviviality are honoured at the Cuba Hostel in Leuven, Belgium. In addition to offering you safe accommodation in an ideal location, the hostel has 8 different types of rooms for single people, couples and even groups. With its numerous gaming and entertainment rooms, including even a small movie theatre, this colourful venue has received numerous accolades from booking sites around the world. Just trust the opinion of the travellers who have been here and set foot here to be enchanted. 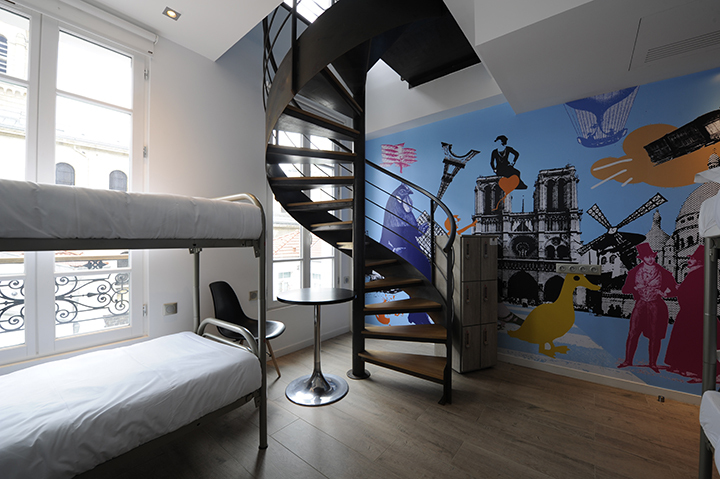 Nothing’s better than a night at the Wallyard Concept Hostel to travel but still have a feeling of being at home. Close to Berlin’s city centre, this hostel is renowned for its excellent price/quality ratio and its friendly and welcoming staff. It is one of the youth hostels in Europe that people constantly boast about. No, this is not the decor for a comic strip, but the Lavender Circus Inn. Located in Budapest, Hungary, this destination of choice for many travellers never goes unnoticed. Founded by two experienced travellers, Amsterdam’s Cocomama is the perfect mix between the luxury and comfort of a hotel and the friendly and invigorating atmosphere of a youth hostel. Budget-friendly, this welcoming place is located very close to Amsterdam and is very accessible as much on foot and by bicycle as by car. In the heart of the beautiful and surprising city of Reykjavik in Iceland lies an extraordinary youth hostel. Located in a former cookie factory, this unique location can accommodate up to 215 people each day. With an industrial and modern décor, the KEX Hostel will please you as soon as you arrive. Whether you want to rest after a long day or meet wonderful people, the Sir Toby’s Hostel in Prague is the ideal place to take a break before continuing your travels. With its nod to Czech culture and its bar in a brick cellar, the atmosphere of the place and the price/quality ratio surpasses expectations. The brightness and simplicity of the Generator Copenhagen Hostel will remind you of the beauty and elegance of the Scandinavian regions all while introducing you to a different culture. From the entertainment room to the bedrooms and the kitchen, the minimalist design of the place and the warm and peaceful atmosphere will totally meet your expectations. Travels remain forever etched in our memory and allow us to have stories to tell for the rest of our lives. On the other hand, the place where you stay when you go on an adventure is of capital importance in order to live a beautiful and worry-free experience. That’s why these 12 European youth hostels are a must if you’re lucky enough to travel to this beautiful continent soon.